Oil and Fuel Storage tanks (API 650 design) are typically used in petrochemical plants. They are large field fabricated storage tanks operating at low pressures or atmospheric pressures. 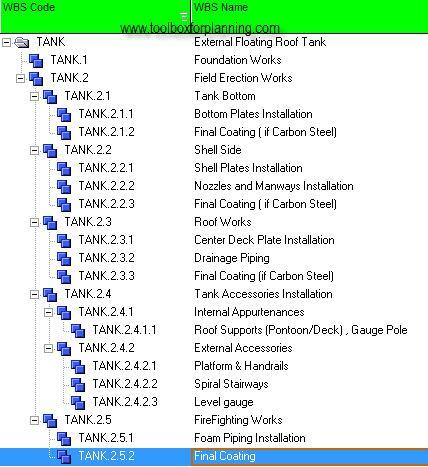 There are various types of tanks such as fixed roof tanks and floating roof tanks, etc. Tank bottom is usually constructed of overlapping steel plates welded by manual or automatic welding technique. Tank shells are constructed from courses of steel plates. E.g. First shell course, 2nd shell course and so on. In this article, we will focus on a specific type of tank, external floating roof type with single deck and internal pontoon. 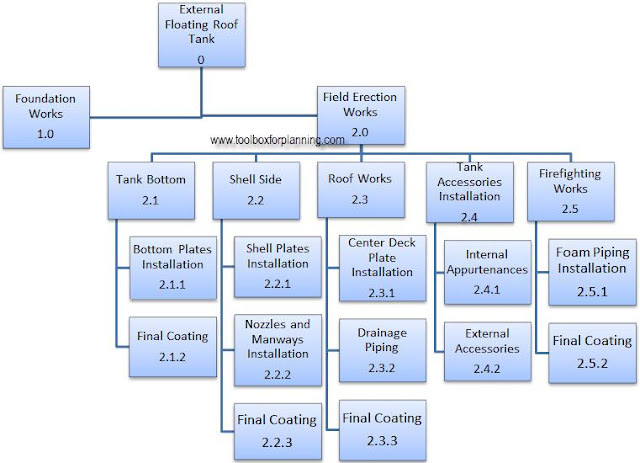 Sample Work Breakdown Structure (WBS) for an external floating roof type designed tank construction project can be decomposed as the following. As tank erection work is only focused, detailed WBS for foundation work is intentionally left at level 1. It is just to show that foundation is required for the above ground storage tank. The above WBS format can be represented as a hierarchical structure as shown in figure below. Sample WBS for External Floating Roof Tank in Primavera P6. Simply download sample WBS template in Excel, MS Project and P6 and you can start building detailed deliverable list and project schedule. Dear reader, you are welcome. 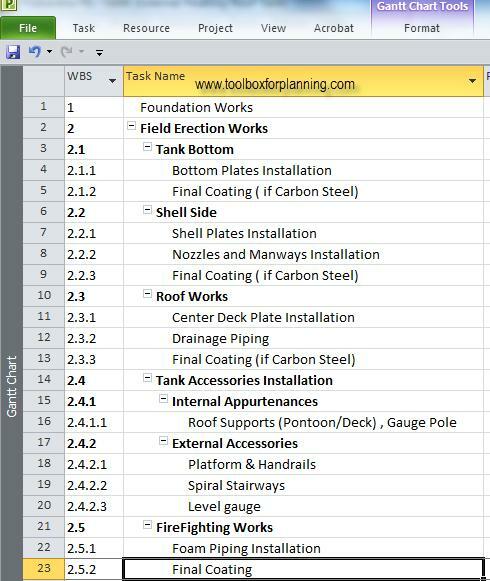 It would be very useful for a junior planner like me if you could share with us your thoughts about how to prepare the WBS for the piping work in a plant or refinery. Should we proceed by height, by area, by phase? I have to planify the construction and assembly on site of a 1200-line chemical plant. Dear reader,refer to new post on WBS for the piping work. a lot of thanks to you. it helps me a lot. Thanks alot very usefull information. I wil be very thankful if any one could send me Storage tanks construction regarding information, procedure, steps, and storage tanks construction planing relevant material..
it is the first time for me , to create a project of two tanks one of oil and another for water on primavera 6, how could i will be helped ?